MORE passengers can now be accommodated in a single Cebu Pacific flight in high density routes with the acquisition of Airbus A321neo. 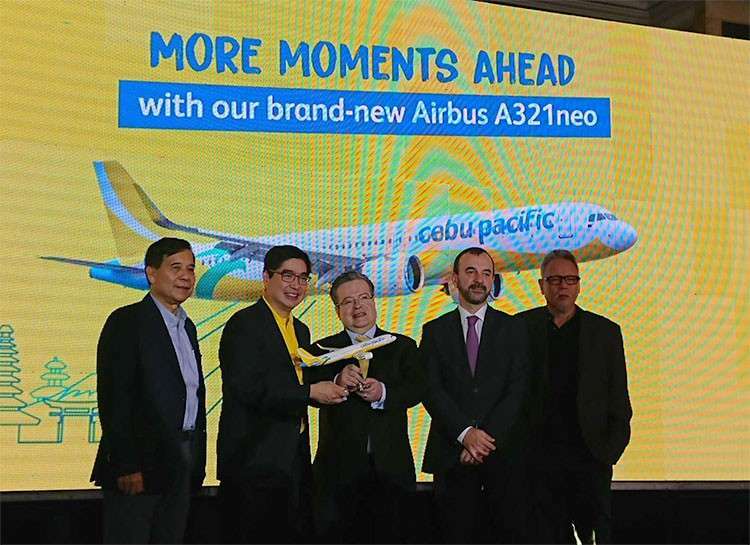 Cebu Pacific Air welcomed Thursday, January 31, the delivery of the first of its new fleet of Airbus321neo from the Airbus plant in Toulouse, France, at Makati Shangri-la. Lance Gokongwei, Cebu Pacific Air president, said at the welcome ceremony that the A321neo allows Cebu Pacific to carry more passengers without adding frequency and to maximize airport slots. A321neo (new engine option) has 236 seats or 56 more than an A320 has. Every month this year, Cebu Pacific will receive one brand new aircraft. Scheduled for delivery this year are six A321neo, five A320neo and one ATR 72-600. Twenty more are up for delivery after 2019. Gokongwei said, "2019 is the year we accelerate growth." To accomplish its expansion plans, Cebu Pacific is investing in fuel-efficient and single-aisle jetliners such as A321neo. The first A321neo was delivered to Cebu Pacific on Jan. 27, 2019. It now services the Manila-Cebu, Manila-Davao and Cebu-Davao routes of Cebu Pacific Air. The A321neo has a 3-3 seat plan with a single aisle. It offers a deeper pitch or more leg room. Each seat has a USB port for gadget connection. Candice Iyog, Cebu Pacific Air vice president of marketing and distribution, said in an interview with journalists after the welcome ceremony, said the A321neo fleet will serve high density routes for now. "It's just an up-gauge. We're not going to use them to open new routes," she said. In aviation parlance, a gauge is the replacement of an aircraft using the same flight number. Cebu Pacific Air removed from its fleets the last of its A319 on Dec. 31, 2019, Gokongwei said. The oldest plane Cebu Pacific Air is flying commercially is five years old. It also plans to dedicate two turbo prop planes to carry cargo. The first ATR is expected to arrive in March 2018.